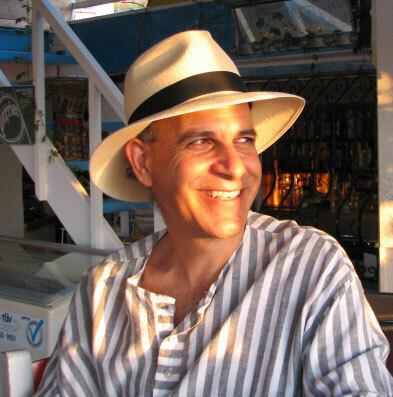 I was born in Cyprus in 1957 and brought up from the age of eight in the hard, yet full of character area of South London in the Old Kent Road. I went on to attend Goldsmiths School of Art where I studied sculpture under the guidance of Bobby Jones, Michael Kenny and Brian Falconbridge. I also had contacts with other leading artists who taught at Goldsmiths such as Michael Craig Martin, Carl Plackman and Richard Wentworth. Whilst at Goldsmiths, I became aware that Michaelangelo, Rodin, Henry Moore and many other artists referred to the ancient Greek sculptures as the height of art and as the ultimate source of inspiration recognising how, at the core of their work, there was a desire to develop and surpass these masterpieces. It was this admiration and desire to emulate that lent a particular strength to the artists’ work. As I studied sculpture I became increasingly aware of the importance of Greek culture to the western world and of the significance of my Greek roots. I admire classical Greek sculpture for capturing human strength, spirit, harmony and movement to the highest degree. In short, it seizes the human senses and this is precisely what my work strives to capture, in my own very individual style. It is this inner strength and genuine expression of my work that makes it stand out, something I fought hard to achieve, as it meant cutting myself off from all artistic influences and trends which surrounded me. This is why, after graduating from Goldsmiths School of Art in 1979, I decided to move to Cyprus. I believed that it was as a result of being at Goldsmiths where a free mind and spirit were respected and, indeed, encouraged that I developed an independent artistic spirit; this better helped me to understand and develop my own artistic expression, rediscovering the Greek aspect of my roots in order to realise my artistic self. It is this outlook on life that I gained from Goldsmiths that led me to leave a career in England in search of this genuine and individual artistic development. I stayed true to my beliefs in all circumstances and the resulting originality and power of my work is something I feel I could not have achieved had I remained in England. I realise that what distinguishes the work of a great artist is the individual feelings and instincts used in its creation, a power and energy which then exists within the piece and is felt by whoever sees it. It is this energy and artistic instinct which are of the greatest importance in my work. My art has been inspired from organic movement in nature such as olive trees, sea waves, shadows and the illusiveness of cloud movement as well as the rhythmic motion of dancers and animals. 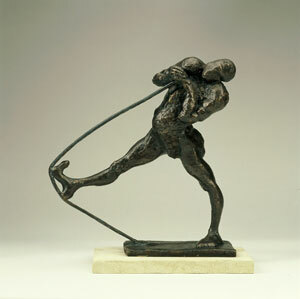 Love of the human figure and movement is the greatest strength in my sculpture, drawings and portraiture. Attention to the human figure and to the movement brought me to see the animal characteristics within the human form. This is something which had become an integral part of my work and which characterises it with a particular power and originality. When creating a portrait, my foremost interest is to capture movement, inner spirit and animalistic characteristics of the particular model. As a result, my portraits vary greatly from the angelic innocence of a child and the worn kindness of a mother to the hard stubbornness of a political figure. 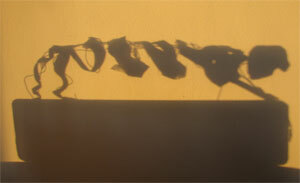 I use many different mediums in my sculptural creations which I feel best suits the subject. Colour plays a fundamental part in my work using paint, patina and combinations of materials, depending on sunlight and the surrounding environment in which the sculpture is to be placed. I work with stone, marble, clay, bronze, plaster, wax, wood, polystyrene, fibreglass, glass, copper and stainless steel. My expertise is unique in this field and ranges from small works of 30cm high to projects of landmark site specific sculptures executed totally by myself. I also have a vast experience of working with a wider team eg. technicians, architects, collaborators and clients. Maquettes will not be copied outright by technicians and therefore all work is totally exclusive and harnessed with all my sensitivities, making it a one-off original work of art. The development of my work has led me into the realms of architecture and therefore it does not fall into any one particular artistic category but what is constant is the feeling and honesty found in each piece, each piece being the result of genuine artistic emotions depicting human sensitivities. 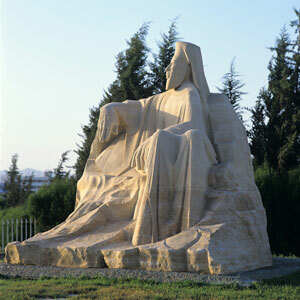 After winning a competition for the Police Federation in Cyprus – executed a monument to Archbishop Makarios, carved out of solid stone, on site. This entailed quarrying four monolithic pieces of stone and transporting them to site (weight of monument over 80 tons). 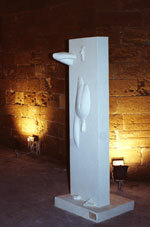 From a 30cm plaster maquette, I enlarged and carved it out with the assistance of a Stone Mason. The finished monument being 3.5 x 3.5 x 3.5 metres. I also designed and executed the landscaping around the monument. Commission for monument for six heroes situated in the Troudos Mountains, Cyprus. A bronze relief cast in sand, 4 metres in length including water features, executed totally by myself. Input of community which inspired me to design the work. Monument situated in the main square – Liberty Square, Nicosia – commissioned by the President of Cyprus. This was executed under extreme pressure and was completed within a two week time scale of the state visit of the President of Yugoslavia to commemorate the friendship between Yugoslavia and Cyprus. Myself and a team of engineers, technicians and labourers worked around the clock to complete the work on time and on budget. There was no room for error as the date was already set for the unveiling. A monument of this scale would normally take over six months to complete. (The President of Yugoslavia requested to congratulate and thank me personally for accomplishing such a monumental achievement).